I ffffound this sweet little drawing and couldn't agree more. I've always liked Pugs; their repuglsive (sorry) little squashed up faces, massive black eyes and their laborious wriggling walk. I recently told my Dad I was going to get a Pug one day, to which he adamantly replied "No, they are deformed. You are not getting a Pug. They are genetically-impaired, hideous mongrels. They're not even allowed into Crufts." But I hadn't planned on entering it into Crufts, so I'm going to get one anyway. 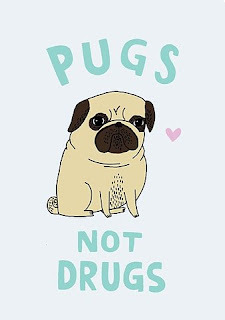 Pugs not drugs.